Although Britain already had a history of raising camel-mounted troops in North Africa and the Middle East, the first such troops raised for the Great War were Australians back from the Gallipoli campaign in early 1916. Their success lead to the raising of further battalions later in the year, including one of British and Indian troops, mostly raised from yeomanry cavalry units that had been dismounted. Such men were mounted infantry, as the camel is a very poor platform from which to conduct a fight, but their big advantage was the range that they could reach thanks to the legendary strength and tenacity of the camel, and the large loads they could carry. In addition, the animals could travel in areas where the new armoured cars could not, so the British camel troops, as part of the Imperial Camel Corps (ICC), played their part in the eventual defeat of the Ottomans in Palestine and Syria. As mounted infantry the appearance of these men was something of a hybrid of infantry and cavalry, but the basic uniform was the standard Khaki Drill Service Dress common to both, consisting of a jacket, trousers, puttees and short boots. Variations were common, including the wearing of shorts, but all these figures have the regulation clothing, and it has been properly done in all cases. Every man wears the standard Wolseley-pattern helmet or sun hat, which again was not the only form of headwear worn by the British camel soldiers, but is perfectly reasonable here. The men wore the usual cavalry bandolier rather than the infantry rig, so every man should have the 90-round leather bandolier around his trunk. For some reason however Strelets have only given their men the older, 50-round version, thus missing the four pouches round the back. Plenty of photos show these men with the 90-round model, so this is an error on these figures. During the war much of the dismounted cavalry were given infantry waist belts with pouches, and these men have this too, which seems reasonable. Each man also has a haversack and water bottle, again normal issue and properly modelled here. The man holding the Lewis gun has a pouch for the magazines, and one man also has a bugle on a strap, so apart from the bandoliers the appearance of all these figures is accurate. The nine mounted poses in this set are all of men in fairly relaxed mood, and happily no one is fighting from the saddle. Many pictures show the men with legs crossed in front of the saddle, but there are none here. However the men with legs partially crossed, and those astride their mount, are also perfectly valid. Each man holds his rifle, which caused us to wonder why. No one would carry their rifle continually on a long patrol lasting many days, so we would expect this to be holstered or at least slung most of the time. Presumably holding the rifle makes mounting and dismounted that much more difficult, so when on patrol we would have thought the rifles would normally be stowed somewhere, especially as they would not be used from the saddle. This applies doubly for the man clutching the Lewis gun – just very hard to believe. The three dismounted figures all add to the total in their own way. The man clearly holding or pulling an animal is a very worthwhile pose, not least since when in action one man in 12 or 16 was delegated to holding the camels. However we ask again why he has a rifle in his hand, and we should also point out that he has no animal to pair with, as all the included camels are enough only for the mounted men. 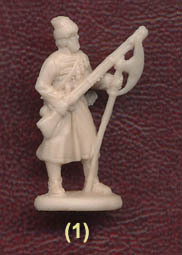 The other two foot figures are for the Signals Corps, of which some were attached to the Imperial Camel Corps. The first man is handling a heliograph, a very useful means of communication, particularly in the flat and sun-drenched landscapes of Egypt and the Middle East. The device is nicely done, but rests on a tripod which is no wider than a normal figure base, so is very narrow and so unstable. Clearly this is a compromise, but from the side it still looks good. The same observation is true of the second man, who uses a large tripod-mounted telescope, probably to view heliograph signals. Again this is nicely done in a single piece, but as it is taller the very narrow tripod is even more obviously a compromise. Having looked at the men in detail, it is now the turn of the camels. Camels have occasionally been made before in this hobby, but this is the first of several Strelets sets to use these particular models, so we will take a very close look. The camel gait is rather different to that of the horse, and actually the long thin legs should make this quadruped easier to sculpt than the horse. The general proportions we thought were very good, as was the overall size. However on closer inspection, some of the poses are poor. The first two camels photographed above are both walking, which is just what you would want in such a set. Both have their left front leg being raised off the ground, but in this part of the step their left rear leg should be forward, and the rear right far back, so here the back legs are the reverse of their correct positions. This is a basic error easily checked on any number of videos of camels walking, so particularly unimpressive. Camels three and four above have all four hooves on the ground, so are not moving at all, yet their legs are widely spaced (particularly the first animal), so are standing in a very unnatural and cumbersome way. The fifth animal is better, standing in a more natural way, although generally the legs on one side are closer together than the other, and the creature lying down is well done. Since these animals are to be used in many current and future sets, it is really disappointing to see them done this poorly. The saddles and cloths are fine, but we were disappointed at the lack of equipment attached to them. One of the major advantages of camels is the large amount of load they can bear – loads of over 200kg were common – far more than a horse could carry. This is just as well when embarking on a long patrol in the empty desert, and the ICC made the most of this. The normal rig called for a bag containing up to 22kg of durra (feed for the camel) on one side, balanced by a fantass or fanatis (metal container) of water holding 20 litres. Over these were large canvas bags containing all manner of kit necessary for a fight or simply survival, all of which meant the animal was well stocked when on duty. There is nothing of this here. The saddles are placed on top of blanks and covered with a cloth, which is fine, but there is no sign of any equipment apart from four small bags which plug into the extra rear holes found on two of the camel models. None of the animals has any reins, which is easy to understand, but there is one more mistake to be highlighted with this set. Those men with legs either side of the camel are wearing stirrups. Now stirrups were invented to provide a firmer platform for mounted men to fight, and of course these men would not fight from the saddle, so stirrups are a nonsense here. While they are fairly easily trimmed off it is again disappointing that the mistake is made at all, particularly as Strelets knew there were no stirrups for those with crossed legs! However it does mean you could use these men as horse-mounted troops if you could find appropriate horses. The general sculpting of both men and camels is very good, with appealing proportions and good detail. The detail is not quite as sharp as some sets, but likely to be more than adequate for most customers. The mounted men need a little effort to set them on their mounts, but once done with the pegs in the front holes the result is a really good and secure fit that needs no gluing. With barely any flash and no noticeable extra plastic, these are very nicely produced. The signallers are of course useful for much more than just these camel troops, so are something of a bonus in that respect. However it is the unexpected choice of poses, the poor camel postures, missing kit and incorrect ammunition bandoliers that let down what could have been a great set, despite its many positive aspects.